A sample page. Click to enlarge. While chatting about research at work (I’m currently curator at a Pennsylvania German historic site outside of Philadelphia), a couple of visiting researchers mentioned that the University of Pennsylvania digitized the 1767 Philadelphia County tax assessments, which includes present-day Philadelphia and Montgomery Counties. 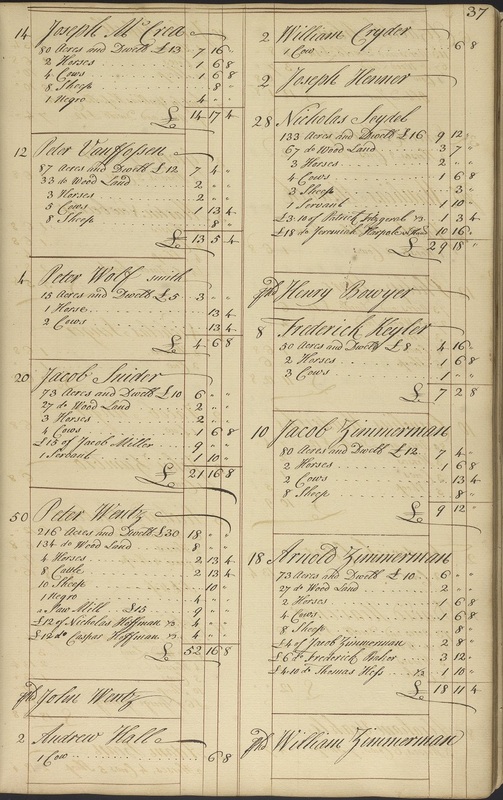 Records of individual tax assessments for Philadelphia County for 1767, arranged by township or ward…. Entries list real property, livestock, and financial debts and assets, as well as often listing occupations and occasionally noting number of children. Slaves and servants are listed in some entries. A few women, mostly widows, have their own entries. Fortunately, there is a faithful digital image of each manuscript page. Unfortunately, it is not searchable, so you’ll have to go through it page by page. But that’s the fun part.